The Osakis Creamery Association’s roots date back to 1909, to help local milk producers get a better price for their products. Over the years we have grown to be one of the leading feed, agriculture and farm supply within a 75 mile radius of Osakis. We understand the unique demands of the industry, and provide the products and services necessary to run a successful ag operation. We are independent and truly belong to the members of the community we serve. 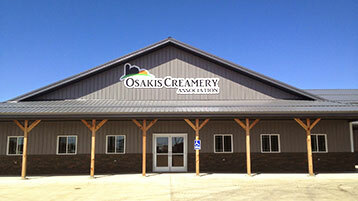 Osakis Creamery Association is dedicated to continuous improvement and growth of our products and services in order to best serve the ever-changing agricultural landscape. As our customer needs change, you can be sure we take the lead. The dedication we have to continued growth is evident throughout our rich history. We take great pride in servicing our customers and identifying the right products for the highest rate of return for their investment. We thank you in advance for taking the time to learn more about your local cooperative. Recent history includes the completion of our new, 24,000 square foot facility —designed to better serve our valued patrons. Serving our farming community, pet owners and neighbors with a variety of products, our new retail store, located at 114 E Main Street in Osakis, caters to homeowners and hobbyists alike. The knowledgeable staff can help with pet and wildlife feed recommendations, lawn and garden care and much more. We also have apparel, unique gifts and collectibles. Visit your locally owned and operated cooperative to learn more about our products and services. We look forward to another century of unsurpassed value to our community. Growing with the community we serve…for over a century! ©2016 Osakis Creamery Association. All Rights Reserved. Website by Arvig® Media.